Accept a variety of M.2 SSD blade lengths up to 80 millimeters to give you the most flexibility in your solid state drive choices. A SSD blade enclosure made of aluminum to help dissipate the heat that these modules crank out during heavy Read/Write bursts. Support UASP protocol to ensure maximum data transfer rates that older BOT protocols can't match. Come with BOTH new USB-C Type-C and conventional USB 3.0 Type-A cables for connection to Macs or PC's old or new. Be easy to assemble: Either a SSD enclosure that's tool-free or has a minimum number of screws. For peak performance, we recommend the bleeding edge Samsumg Evo 970 SSD blade, however more affordable M.2 modules like the Crucial P1 or Western Digital's WD Black series are fine choices as well. New Mac models with 3rd generation Thunderbolt ports deserve an equally fast backup solution. Samsung's performance leadership with SSD's in general makes their Apple compatible Samsung X5 Thunderbolt 3 external SSD drive a good choice. With sequential Reads up to 2800MBps and Writes in the 2300 MBps range, the speeds will blow away your previous notions of how fast data backups and file transfers can be. The Mac friendly X5 Thunderbolt 3 portable drive uses Samsung's NVMe PCIe based blades using the same 64-layer V-NAND flash as their highly regarded 860 EVO series laptop SSDs. 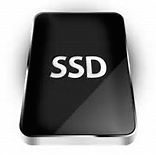 The solid-state drive is supported on recent MacBooks and Macintosh desktop computers with the modern Thunderbolt 3 ports running MacOS Sierra, High Sierra and Mojave. Although the 1TB and 2TB models may be a bit pricey for the average Macintosh owner, the 500GB version of the X5 solid-state drive is VERY price competitive with all the other smaller capacity Mac compatible Thunderbolt3 solid-state drives competing in this space. The collapsing cost of solid-state flash memory helps. Conventional off-the-shelf 2.5" SATA SSD's have become ridiculously cheap - and the trend towards high-density PCIe SSD modules / blades are even faster using far less raw materials and space. So Thunderbolt 3 SSD blade drives are appearing (or have been announced) leveraging the prowess of both technologies. We've seen LaCie introduce a $1999 Bolt 3 SSD months ahead of everyone else at a price few mortals could justifiably afford. We've also seen OWC ship their ThunderBlade(tm) 3 portable drive with prices ranging from $1199-$4999 MSRP. Ouch! Fortunately some low-cost portable SSD ThunderBolt 3 drive alternatives came to market early. Both CableMatters and Plugable's TB3 external SSD's appear to be pretty much identical OEM devices, both 480GB in a portable form-factor with a short 6 inch ThunderBolt 3 cable integrated into the drive's case. These are shipping from both Plugable and Cable Matters with Plugable's offering currently about 30 bucks cheaper than the other. Priced just under $300 USD,they were temporarily the cheapest ThunderBolt3 SSD of 2018 and will deliver the most bang for the buck. The tradeoffs include incompatibility with USB 3.1, lack of Thunderbolt 3 pass-through ports for other devices and a non-removable cable. OWC now sells their 'low priced' Envoy Pro EX ThunderBolt 3 SSD for Mac in either very affordable 240GB or 500GB versions. They're now on the shelves or available at online retailers. As more competition arrives in force, downward price pressures will help somewhat. The insanely competitive USB 3.0 and USB 3.1 USB-C Mac backup drive market for HDD and SSD storage for Apple computers has become ridiculously cheap, TBolt will and always has carried a price premium for more demanding enterprise and professional market applications. We're seeing the first of ultra-fast Thunderbolt 3 SSD drives ever made hitting the market. It's always been hard to say 'cheap' and 'Thunderbolt' in the same sentence when compared to low-cost USB 3.0 and 3.1 drives. However, these two kinda cheap ThunderBolt3 SSD's are within financial reach of the average Mac user. These screamingly fast full 40Gbps Thunderbolt3 SSD drives from CableMatters and Plugable use PCIe NVMe SSD blade modules to achieve their impressive Read / Write speeds never before seen in consumer storage with a price tag near or just under $300 USD. For well under $1/Gigabyte they can deliver up to 2400MBps Reads and 1200MBps writes. These currently shipping drives from Cable Matters both offer 480GB / 512GB solid-state modules tied to a ThunderBolt 3 ONLY interface. Note that a new Mac's ThunderBolt 3 ports transmit BOTH native 40GbpsTBolt3 AND 10Gbps USB 3.1 Gen 2 protocols. However the two drives featured above do not operate on Type-C ports in USB 3.1 mode. So they are ThunderBolt 3 ONLY. Also note that on some PC and Mac computer models (notably the first 2016 MacBook Pro series), some ThunderBolt 3 ports might operate at a maximum of 20Gbps -- Not the maximum 40Gbps. In these cases, the cheapest ThunderBolt 3 drives shown above will perform at somewhat lower speeds due to the reduced available bandwidth. Confusing, huh?